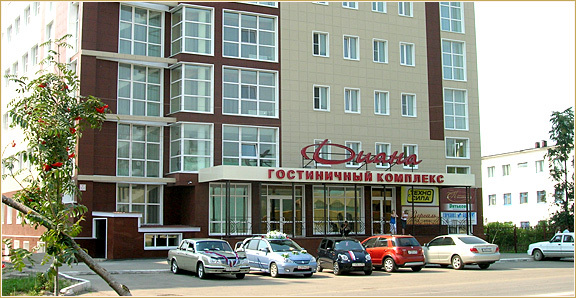 Hotel Complex "Diana" Hotel Complex "Diana" opened its doors to guests and inhabitants of the town of Arzamas on January, 1 in 2008. The convenient situation (at the crossing of central town streets) defined the symbolic hotel name. "Diana" is a goddess of 3 roads; goddess who had a triple power: in the sky, on the earth and under ground; goddess, whose picture was placed at the crossings. There are 49 rooms in the Hotel Complex "Diana". It meets overall standards. Single and double rooms are comfortably furnished. Room telephones with long-distance and international connection, Wi-Fi, cable TV, individual safe-deposit boxes, mini-fridges are at your disposal. A computerized room key is used. You may pay your accommodation and extra services accounts by VISA, VISA ELECTRON, MASTER CARD, MAESTRO. Accommodation, breakfast, usage of individual safe-deposit box, Wi-Fi,llocal calls, cable TV, correspondence delivery is inclusive into the account. In the lobby there is a souvenir stand where guests can buy souvenirs made by local skilled craftsmen. Staff's benevolence and understanding make your stay at the hotel "Diana" comfortable and pleasant.